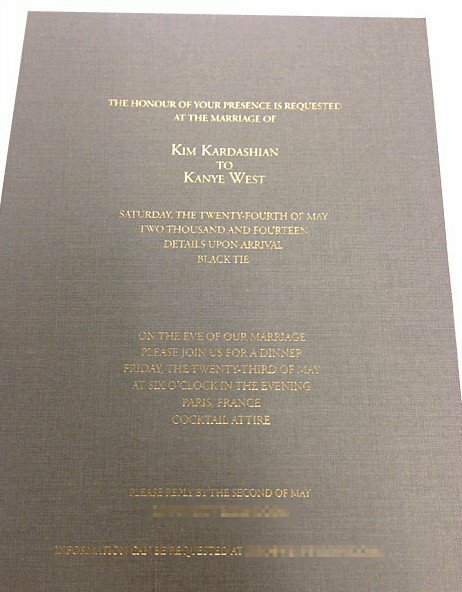 Approximately 100 people were given spots on the guest list of Kim Kardashian and Kanye West’s much-anticipated Paris wedding on May 24. According to Us Weekly, the invitations feature a simple design: gold lettering on a neutral background. Information is scarce; all that’s included are a few lines about the date and dress code for the ceremony and rehearsal dinner. Kim Kardashian and Kanye West are keeping most details under wraps until their friends and family arrive in France. “Guests won’t know the venue until they get to Paris,” a source told the publication. Kim Kardashian, 33, recently tweeted about the upcoming event, noting that the vows would not be filmed, but “everything leading up til and after” would be. “We’ve decided to keep this close to our heart and share thru photos,” Kim Kardashian wrote.